Aston Villa had some anxious moments as they progressed to the FA Cup fourth round for only the third time in nine seasons after beating 10-man Blackburn. 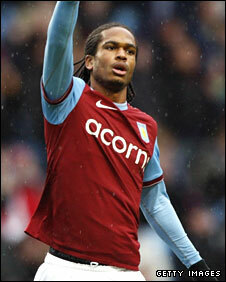 Nathan Delfouneso headed in Ashley Young's cross to put Villa ahead. Bradley Guzan then saved David Dunn's penalty and the visitors rued the miss when Carlos Cuellar extended the lead. El-Hadji Diouf was dismissed before Nikola Kalinic got one back for Rovers who made sure of victory with John Carew's injury-time penalty. The victory will restore confidence for Martin O'Neill's side after two previous defeats by Arsenal and Liverpool and it also demonstrated that Villa have an added depth to their squad this season. Even though they made seven changes to the team which lost to Liverpool, they were boosted by the return of the previously suspended Young who was a threat from the start. Likewise, Rovers' boss Sam Allardyce made nine changes as both managers protected some of their players ahead of Tuesday's Carling Cup semi-final between the sides at Ewood Park. What more can Reo-Coker do to get in our 1st team?? Villa's line-up was the stronger of the two and the home side went ahead after 12 minutes. Cutting in from the left, it was Young's centre who provided Delfouneso with a straightforward header to open the scoring, with the teenager finishing from 10 yards out. Young could have extended the lead himself before Villa's good work looked to have been wasted when they conceded a penalty. Nigel Reo-Coker, who was Villa's captain, was adjudged to have brought down Steven Reid but Guzan saved from Dunn. The miss was made worse when Young's free-kick was glanced in by Cuellar to give Villa a 2-0 lead six minutes later. And things got even bleaker for Rovers when Diouf was given a straight red card before the break when he recklessly brought down Habib Beye. Yet their path back into the match was given an unexpected lift when Guzan dropped an inswinging corner to allow Kalinic to score. Villa suddenly looked perturbed and Kalinic could have levelled matters after being sent clear by substitute Morten Gamst Pedersen. But Villa restored their authority when Reo-Coker had a shot turned round the post and in the 90th minute Gael Givet brought down Carew in the box with the Norwegian sending Rovers keeper Jason Brown the wrong way from the spot. "Ashley set up the opening two goals and he is a top-quality player who is so important to us. "It is three years this month since he came to us from Watford and his contribution for us during that time has been immense. "I'm delighted to have won the game. The players are desperate to play. We utilised the squad today and the young lads, Nathan and Fabien, did very well for us." "I see a lot of those situations that never result in a sending-off. They will justify it by saying it was two-footed but the referee, Howard Webb, is a long way away. "I have to give [my team] great credit for the way they played in the second half but all the damage was done in the first half for us. "At least we showed the right professional approach in the second half to get back into the game, even with 10 men." 90:00+5:39 The game is over, as the referee blows his whistle. 90:00+0:44 GOAL - John Carew:Aston Villa 3 - 1 Blackburn Placed penalty scored by John Carew. Aston Villa 3-1 Blackburn. 89:26 Gael Givet challenges John Carew unfairly and gives away a Penalty. 88:38 Outswinging corner taken by Ashley Young from the right by-line. 87:13 Stewart Downing produces a cross. 87:06 Ashley Young crosses the ball. 86:45 Nigel Reo-Coker takes a shot. Jason Brown makes a save. 84:06 Steve Sidwell takes a shot from just inside the penalty box which clears the crossbar. 82:26 John Carew handles the ball and concedes a free kick. Free kick taken by Zurab Khizanishvili. 82:07 John Carew challenges Martin Olsson unfairly and gives away a free kick. Direct free kick taken by Steven Reid. Correction - 80:55 The ball is sent over by Ashley Young. 80:55 Ashley Young produces a cross. 79:41 Shot from just outside the box by Steven Reid goes over the crossbar. 78:46 Nigel Reo-Coker takes a shot. Save by Jason Brown. 75:46 Substitution Maceo Rigters is brought on as a substitute for Michel Salgado. 75:19 Inswinging corner taken by Ashley Young from the left by-line, John Carew has a header from inside the six-yard box and clears the crossbar. 74:56 Free kick awarded for a foul by Martin Olsson on Ashley Young. Free kick crossed left-footed by Stewart Downing from left channel, Pascal Chimbonda makes a clearance. 74:26 Substitution John Carew on for Nathan Delfouneso. 73:24 Zurab Khizanishvili concedes a free kick for a foul on Habib Beye. Carlos Cuellar takes the direct free kick. 71:35 Ashley Young takes a shot. Save by Jason Brown. 68:41 Michel Salgado challenges Stephen Warnock unfairly and gives away a free kick. Free kick taken by Stephen Warnock. 66:38 Centre by Stephen Warnock, Headed effort from deep inside the penalty area by Carlos Cuellar goes harmlessly over the crossbar. 66:30 Ashley Young crosses the ball. 66:20 Stewart Downing delivers the ball, Gael Givet manages to make a clearance. 65:32 Phil Jones challenges Emile Heskey unfairly and gives away a free kick. Stephen Warnock takes the free kick. 65:11 Effort from inside the area by Nikola Kalinic misses to the right of the goal. 61:31 Outswinging corner taken left-footed by Morten Gamst Pedersen from the left by-line, clearance made by Steve Sidwell. 60:49 Free kick awarded for a foul by Habib Beye on Michel Salgado. Jason Brown restarts play with the free kick. 60:03 Ashley Young decides to take a short corner. 58:10 Ashley Young challenges Morten Gamst Pedersen unfairly and gives away a free kick. Direct free kick taken by Michel Salgado. 57:27 Outswinging corner taken from the left by-line by Morten Gamst Pedersen. 56:31 A cross is delivered by Ashley Young. 54:38 Assist on the goal came from Morten Gamst Pedersen. 54:38 GOAL - Nikola Kalinic:Aston Villa 2 - 1 Blackburn Nikola Kalinic finds the back of the net with a headed goal from inside the six-yard box. Aston Villa 2-1 Blackburn. 53:52 Substitution Zurab Khizanishvili comes on in place of David Dunn. 49:29 Centre by Ashley Young, Jason Brown makes a save. 48:57 Inswinging corner taken by Ashley Young from the left by-line played to the near post, clearance by Gael Givet. 47:57 Nathan Delfouneso has a shot on goal from outside the box which misses right. 47:02 Ashley Young delivers the ball, Jason Brown makes a save. 46:15 Shot from long distance by Martin Olsson misses to the right of the target. 45:46 Stewart Downing gives away a free kick for an unfair challenge on Steven Reid. Steven Reid restarts play with the free kick. 45:01 Substitution Fabian Delph goes off and Steve Sidwell comes on. 45:00+2:16 The referee calls an end to the first half. 44:14 Substitution Morten Gamst Pedersen joins the action as a substitute, replacing Franco Di Santo. 44:00+0:07 Free kick awarded for a foul by Nikola Kalinic on Carlos Cuellar. Bradley Guzan restarts play with the free kick. 42:43 The assistant referee signals for offside against Nathan Delfouneso. Jason Brown takes the indirect free kick. Correction - 41:13 Free kick crossed by Ashley Young. Correction - 41:13 Sent off El-Hadji Diouf is sent off by the referee. 41:13 Free kick crossed right-footed by Ashley Young. 41:13 Sent off El-Hadji Diouf shown a red card for professional foul. 41:00 Habib Beye fouled by El-Hadji Diouf, the ref awards a free kick. 38:50 El-Hadji Diouf takes the inswinging corner, save made by Bradley Guzan. 36:47 The assist for the goal came from Ashley Young. 36:47 GOAL - Carlos Cuellar:Aston Villa 2 - 0 Blackburn Carlos Cuellar finds the net with a headed goal from inside the penalty area. Aston Villa 2-0 Blackburn. 36:01 Booking Caution for Michel Salgado. 35:48 Michel Salgado gives away a free kick for an unfair challenge on Stephen Warnock. 33:35 The ball is swung over by Martin Olsson, clearance by Carlos Cuellar. 32:34 Free kick awarded for an unfair challenge on Habib Beye by Franco Di Santo. Direct free kick taken by James Collins. 32:16 The referee blows for offside against Emile Heskey. Gael Givet takes the indirect free kick. 30:35 A save by Bradley Guzan from penalty by David Dunn. Aston Villa 1-0 Blackburn. 30:35 Booking Nigel Reo-Coker is shown a yellow card for unsporting behaviour. 30:28 Nigel Reo-Coker challenges Steven Reid unfairly and gives away a Penalty. 28:40 The ball is delivered by Pascal Chimbonda. 25:33 Ashley Young challenges Martin Olsson unfairly and gives away a free kick. Gael Givet takes the direct free kick. 22:35 Stewart Downing takes a shot from long distance which goes wide of the right-hand post. 20:18 Ashley Young takes a shot. Jason Brown makes a save. 19:24 Fabian Delph challenges Franco Di Santo unfairly and gives away a free kick. David Dunn restarts play with the free kick. 16:44 Unfair challenge on Habib Beye by Nikola Kalinic results in a free kick. Bradley Guzan takes the direct free kick. 15:58 Michel Salgado gives away a free kick for an unfair challenge on Fabian Delph. Bradley Guzan restarts play with the free kick. 15:00 Inswinging corner taken from the left by-line by El-Hadji Diouf, Bradley Guzan makes a save. 13:12 Steven Reid challenges Nigel Reo-Coker unfairly and gives away a free kick. Free kick taken by Habib Beye. 11:17 Ashley Young provided the assist for the goal. 11:17 GOAL - Nathan Delfouneso:Aston Villa 1 - 0 Blackburn Nathan Delfouneso grabs a headed goal from inside the six-yard box. Aston Villa 1-0 Blackburn. 9:25 The referee gives a free kick against Steven Reid for handball. Bradley Guzan takes the free kick. 7:11 Stewart Downing delivers the ball, Header from close in by Emile Heskey misses to the left of the goal. 6:44 Inswinging corner taken by Ashley Young. 5:48 Unfair challenge on Stewart Downing by Martin Olsson results in a free kick. Ashley Young takes the direct free kick. 5:36 Ashley Young delivers the ball, clearance made by Martin Olsson. 4:51 Corner taken left-footed by Stewart Downing from the right by-line to the near post, El-Hadji Diouf manages to make a clearance. 2:47 Free kick awarded for an unfair challenge on El-Hadji Diouf by Nigel Reo-Coker. Gael Givet restarts play with the free kick. Correction - 1:11 Inswinging corner taken by Ashley Young from the left by-line, Nathan Delfouneso takes a shot. Save by Jason Brown. 1:11 Inswinging corner taken by Ashley Young from the left by-line, Nathan Delfouneso takes a shot. Save made by Jason Brown. 0:40 Inswinging corner taken by Stewart Downing from the right by-line played to the near post. 0:09 The assistant referee flags for offside against Nikola Kalinic. Bradley Guzan restarts play with the free kick.